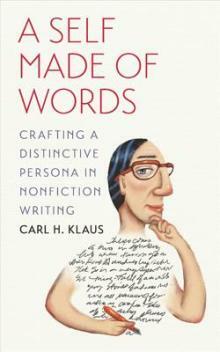 For his part, Klaus has been nothing but a positive force for nonfiction. He came to the University of Iowa in 1962 and spent 35 years teaching nonfiction writing. In the mid-1980s, he found the university’s Nonfiction Writing Program. Since his retirement in 1997, he has co-edited (with Patricia Hampl) Sightline Books: The Iowa Series in Literary Nonfiction published by University of Iowa Press. He is the author or coauthor of a number of nonfiction works, the most recent of which is 2013’s A Self Made of Words: Crafting a Distinctive Persona in Nonfiction Writing. His work in progress as of this writing is entitled Aging: An Octogenarian’s Chronicle. He speaks of his influences and the need to “unlearn” much of what he’d learned about writing in order to find his own voice, as well as of the “descent of the muse” that has been the hallmark of each of his writing projects.